Throughout the Revolutionary War, the thirteen colonies struggled to trust one another and work together. In order to defeat the British, they had to see themselves as one. Ben Franklin warned the other leaders of the Continental Congress that they all had to hang together in the struggle for independence, or else they would hang separately as traitors. I meet a lot of folks who don't really believe in the reality of the resurrection. 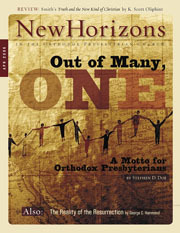 I am talking about Christianseven Orthodox Presbyterians. They believe many things that they read in their Bibles, but not that there will be a resurrection of the dead.